Today we have the pleasure of talking with the amazing Ocean Robbins. Ocean was born in a log cabin built by his parents, and grew up eating food they grew on the land together. At age 16, he co-founded an organization called YES! (Youth for Environmental Sanity) that he directed for the next 20 years. Ocean has spoken in person to more than 200,000 people in schools, conferences and events, and he has organized 100+ seminars and gatherings for leaders from 65+ nations. Ocean’s work has taken him all over the world, where he has seen first-hand the powerful impact of the food we eat – not just on our health, but on people and economies everywhere. And his newly released book “31-Day Food Revolution” teaches us just how powerful food can be in changing our own lives, our environment and our world. Ocean, together with his father John Robbins, runs the Food Revolution Network. They are committed to healthy, ethical, and sustainable food for all. And work in collaboration with many of the top food revolutionary leaders of our time to help empower individuals, build community, and transform food systems to support healthy people and a healthy planet. Robyn: Hey everyone, Robyn Openshaw here. Welcome back to Vibe. Today I am talking to my friend, Ocean Robbins. And I have interviewed his father, John Robbins before on this show because his father, John was pivotal in my own discovery of a different way to eat, a different way to live decades ago, and I credit him with a lot of the inspiration and the tools to turn my own family’s health around and my own health around because I got to put the oxygen on before I can help the others, right? I have really grown to come to respect Ocean Robbins as well. He is really a leader in his own right. He was at the age of 16, the founder of an organization called “YES”, helping visionary young leaders build a better world. He’s very serious about doing his part to improve the planet, just like his father, John Robbins, who is a many time New York Times bestselling author. Well, Ocean is coming out with a book right now called the “31-Day Food Revolution: Heal Your Body, Feel Great and Transform Your World”. He has been running The Food Revolution Summit, which is the very best summit I’ve ever been a part of. 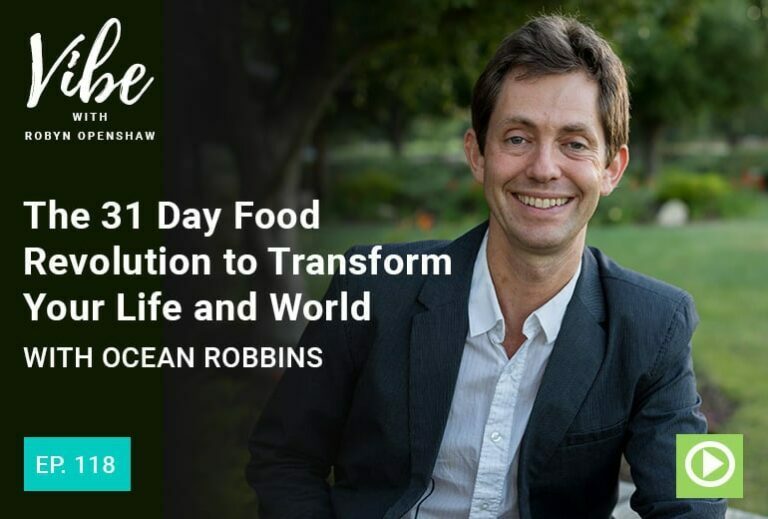 I’ve promoted it the last couple of years because he brings together literally the biggest names in health and nutrition and John Robbins and Ocean Robbins do incredible interviews in this summit every year. They have reached a couple of million people in this summit that they do. If you don’t know who John Robbins is, he was the son and the only heir to the “Baskin Robbins” fortune. He was supposed to take over. He was supposed to lead that billion dollar company into the future and he said no because he felt like what “Baskin Robbins” product does is hurt the health of Americans. It actually hurt the health of both Baskin and Robbins, and so I think he’s an incredibly courageous person. He’s not heavy handed or judgmental towards people who make choices that he feels are not wise ones, with regard to being stewards for the planet, but instead, both John and Ocean Robbins are such compassionate voices for helping us eat more plants, helping us care for the planet that we live on. So I think you’re going to love this interview with Ocean Robbins. He’s also been an adjunct professor in the Peace Studies Department at Chapman University. He’s put together 50 different week long gatherings. He’s done 100 day long workshops for leaders worldwide. Because he is my friend, I can tell you he is the real deal. I think you’ll really enjoy this interview with the amazing Ocean Robbins. So welcome to the Vibe show Ocean. Ocean Robbins: I am so thrilled to be with you, Robyn. Robyn: So great to talk to you again. I just think the world of you and I think you put on an amazing summit every year and you bring together lots of great thinkers and I think that for people in the plant based world, the Vegan Revolution, all of that, you’re just so very grounded and compassionate towards other people with different points of view and you really bring everybody together really well. Ocean Robbins: Well, thank you. You know, we are in such urgent times. A third of our kids are expected to get diabetes in their lifetime. Two thirds of us are overweight or obese. The cost of out of control medical care is driving our nation into bankruptcy. And in this context I think that there is so much hope. And you know that and I know that and we’re here to spread that hope so that people can get results because the status quo is killing us and it’s sickening us and it’s hurting us, but something better is possible. We can thrive when we just feed our body the right foods and create the lifestyle that supports health. Robyn: Yeah. I think that one of the things that’s most unique about your work is your compassion, not just for the planet which you’re super passionate about and we’ll get into that, but also just for people wherever they are in their discovery and learning about what to eat, what impact that has on their families and their children and on this planet that we have to leave our children. But of course, you know, I’m going to ask you about your family’s background because your father is a New York Times best seller who wrote about having an ice cream shaped swimming pool in his backyard. Tell about that from your third generation perspective about who was your grandfather and and what was that like growing up Baskin Robbins? Ocean Robbins: Absolutely. So as you know, my grandpa founded 31 flavors ice cream company with his brother in law, Burt Baskin. My dad John grew up being groomed to one day join in running the family company with 31 flavors of ice cream in the freezer at all times. And when he was in his early twenties, he was offered that chance and he said no. And he left a path that was practically paved with gold and ice cream too. As we jokingly say in our family, to follow his own rocky road. He ended up moving with my mom to a little island off the coast of Canada where they built a one room log cabin, grew most of their own food, practiced yoga and meditation for several hours per day and named their kid Ocean. That would be me. They say they almost named me Kale, Robyn. I’m glad they went the conservative route on this one when it came to naming their son, but we did eat a lot of Kale along with cabbage and Broccoli and Brussels sprouts and all sorts of other veggies from the garden. As they got a little older, we moved to California and my dad wound up writing a book called “Diet for a New America” and he became this international spokesperson for health and food and a healthier world and how food could be an opportunity to take a stand for the lives and world we want. His book sold millions of copies. One of his readers ended up being my grandpa. So my grandpa’s brother in law, Burt Baskin, my dad’s uncle, had died of heart disease at the age of 54 and at 71, my grandpa Irv, who’d always eaten the Standard American Diet, plus the extra scoop of ice cream on top was faced with the Standard American diseases. He had serious heart disease. He had serious type two diabetes. He had major weight problems and his doctors told him he didn’t have long to live unless he made some changes. And then they gave him a copy of my dad’s book “Diet for A New America”. Amazingly enough, my grandpa read it and he followed his advice. He made big changes in his diet. He gave up sugar. He ate a lot less processed foods. Even gave up ice cream. And he started eating a lot less meat and eating a lot more whole plant foods and vegetables and he got results. He actually managed to reverse his diabetes and heart disease symptoms. He got off all of his medications that he no longer needed and he lost 30 pounds. His golf game improved seven strokes and he lived another 19 more healthy years. So we have seen in our family what happens when we eat the Standard American diet and we’ve seen what happens when we make a change. And I’m passionate about sharing this with as many people as possible. And I wrote my new book. “31-Day Food Revolution” to help everybody have this lifesaving wisdom and put it into action. Because you know, at the end of the day, heart disease, cancer, Alzheimer’s, they don’t care a heck of a lot what you know or how many podcasts you listened to or how many books you read, but they do care what you eat and how you live. And so I wrote this book to help make it as easy as possible for everybody to put that lifesaving knowledge into practice. Robyn: Well, I just figured out as we started this interview, it just struck me when you mentioned 31 flavors because I personally haven’t been in a “Baskin Robbins” in decades since I, and you know, your father’s work was a big part of this, you know, I had to turn away from very much a meat and processed food diet to turn my own health around. I just realized the significance of the “31-Day Food Revolution”. Get it everyone? Ocean Robbins: I’m saying that at the end of the day, 31 steps to health is going to give you more pleasure and more satisfaction even than 31 flavors of ice cream. So of course there had to be 31 chapters to my book and we’re building on that theme and taking it to the next level. Ice cream has brought a lot of smiles to a lot of people’s faces and a lot of joy. But at the end of the day, there’s more pleasure and more joy in a healthy body and a clear mind. Robyn: Oh, very well put. You know your work, I think you’re going on your eighth year, ninth year, if you’re going to do the Food Revolution Summit. Your organization is called “The Food Revolution Network”. Your brand new book, which I’m very excited about. I’m really excited to tell our audience about it. We are telling you about it folks, the week that it releases called the “31-Day Food Revolution”. What exactly do you mean by a food revolution? Ocean Robbins: Yeah, I mean that we live in a toxic food culture in which it’s considered normal to eat food that is polluted with pesticides, herbicides, fungicides, antibiotics, hormones, added sugars and chemicals with names we don’t even know how to pronounce. Your body was designed exquisitely to eat food and to digest it and to absorb what’s useful to excrete the rest. But it was not designed for the chemical cocktail that the processed food industry is serving us today. And they have designed their products to get us hooked, to make us eat more than is good for us to not even know when we’re full. They have designed their products to strip them of fiber, vitamins and minerals so that we may be overwhelmed with calories, but nutritionally starving. And what I’m saying is that we need a food revolution because enough is enough. More and more people are sick of feeling sick and fed up with toxic food and hungry for a change. And what we need is a fundamental reinvention of how food is processed and how it’s prepared and how it’s grown, and of course, how it’s consumed. So that food becomes an opportunity to vote for the health we want and the lives that we want. The way I look at it, Food 1.0 is about survival. If you can get enough calories to fill your belly, then that’s success. And in Food 2.0, the central organizing principle is commerce. It’s the buying and selling of food as a commodity. Food 2.0 has brought us incredible tastes and textures and cuisines and 31 flavors of ice cream, but unfortunately it’s morally bankrupt. Which is why I’m calling for Food 3.0, where we make health a central organizing principle of our food system, health for our bodies and health for our planet. And you know, there are plenty of healthy profits to be made in Food 3.0 they come however from healthy foods. Robyn: Okay. So you said our diet is morally bankrupt. I’ve never heard anybody say that and I think we could probably take that conversation a lot of different directions, but what do you think of when you’re saying morally bankrupt? Tell us what you mean. Ocean Robbins: Well, what I mean is that the food industry is governed more by profits then by helping people be well. And so if there’s more money to be made by stripping the fiber out of food and adding more sugar and more salt and more artificial flavorings, then there’s big financial incentive for companies to do just that regardless of the long term health impact on you and me and future generations. And similarly, the healthcare industry is also a little morally bankrupt because it’s focusing on disease symptom management. There isn’t a lot of profit to be made in wellness, no physicians are getting rich off of helping patients be healthy and not have to come into the doctor’s office in the first place. So obviously I’m not saying that our medical providers are wanting to make us sick. I’m saying that there is a disincentive financially in the system for them to take prevention and wellness and lifestyle seriously. And so that’s why it’s up to you and me and everyone who cares and gets informed to put this knowledge into action so that we’re not dependent on the food industry or the health industry for our health and our wellness. Because when we simply eat the right foods, we can stay out of doctor’s offices altogether. When we eat the right foods, we will have the vibrancy we need to even to make smarter choices as the years go by because our minds are clear and our bodies are well. And I want that for you. I want everyone to be able to apply the latest learnings of medical science and put them into action in their lives. And that’s really why I wrote this book and why I’m so passionate about this mission and I founded Food Revolution Network with my dad in 2012 and we’ve grown rapidly, we now have over 500,000 members. And what I’m seeing as we spread the word and engage people all over the planet is that everybody eats and that most people are actually kind of confused about what the heck they should be eating. There’s a lot of almost rampant confusion out there. We hear that fat’s bad, we hear it’s good. We hear carbs are good. We hear they’re bad. You know, we hear that we should eat more tomatoes and Kale. Then we hear, oh but, watch out for all the lectins and the goitrogens. You know what happens when people are confused, the status quo is usually what prevails. And the status quo is killing us. So I think the good news is that most serious researchers are not at all confused about what’s optimal for human beings. In most cases, there’s profound alignment. We all know that we need to eat less sugar and processed junk. We all know that we need to eat more real whole plant foods and more vegetables. This is not controversial, this is backed up by thousands of medical studies. And so in my book, “31-Day Food Revolution”, I really set out to help everybody to understand what’s known, what’s clear, what’s pretty much decided when it comes to nutritional science and then to put that into practice. Robyn: You know, there’s so many subtopics that we could cover and we won’t be able to get to all of them. And of course we want you to just read the book, but I know that in chapter 25 of your 31 flavors, I mean chapters, you talk about genetically modified foods. And we find that our audience is really interested in this and confused about it. I even have employees who challenge me when I say it doesn’t seem wise that we eat these genetically modified foods or that we support this industry because they don’t test what they’re doing. They do it, roll it out, and we just hope that the whole ecosystem isn’t affected. We interviewed Jeffrey Smith who I know that you know on episode 88. Can you just address, I know there’s so much we could talk about, but I know that there was a big promise that we all as a culture got excited about, but the reality has turned out to be different. Would you talk a little bit about whether you believe the evidence shows that genetically modified foods are helping feed a hungry world as we were promised? Ocean Robbins: Well, thanks for asking Robyn. This is actually pretty important. First of all, what’s a GMO? A lot of people think it means God Move Over, but it actually doesn’t. It means Genetically Modified Organism. And Monsanto now owned by Bayer along with Syngenta and Dow and the other big companies in the biotechnology industry. They promised us that GMO’s would give us bigger yields to feed a hungry world, more drought resistant crops that they would give us better nutritional profile and better flavor and reduce pesticide use. But now 25 years into the mass production of GMO’s in the food supply, none of those benefits have actually materialized. Genetically engineered crops have not brought us bigger yields. They have not brought us less pesticide use. In fact, they’ve brought us more than 500 million new pounds of pesticides on our crops. They haven’t brought us more drought resistance or better flavor or better nutrition. What they have brought us, is plants that have one or both of two traits. One is that they are pesticide producers. They literally produce the insecticide BT in every cell of the plant so that when certain bugs take a bite, their stomachs split open and they die. Now BT is generally considered fairly non-toxic to humans. It’s been used in organic agriculture for a long time, but that’s when it’s sprayed on the outside of the plant. Now it’s in every cell of the plant, so BT corn for example, has BT in literally every single cell. I don’t know anybody who wants to go out and drink BT, but functionally we’re eating it when we consume that corn. And the other trait is that these crops have been engineered to be herbicide resistance. This means they can be sprayed with glyphosate, which is the active ingredient in RoundUp, or they can be sprayed with 2,4-D, which is one of the two active ingredients in Agent Orange and the weeds that are next to them will die. But these crops will stay standing because they’ve been engineered to resist that herbicide. So now our crops have become kind of herbicide sponges. They’re being sprayed with weed killer. Now, what’s the impact of all this weed killer? Well, we’re eating it too. When we eat those crops. Humans are eating vastly more weed killer than any time in history. And the impact is controversial, but we know that glyphosate has been found to be a probable carcinogen by The World Health Organization. We know that it’s an endocrine disruptor. And we know that it’s been patented by Bayer as an antibiotic. This means that it can kill bacteria. We know that there is an epidemic of digestive health problems that humans are facing today in the modern world and we know that rates of so called leaky gut syndrome are skyrocketing and that more and more people are getting allergic to things they weren’t allergic to. In fact, rates of everything from peanut allergy to gluten intolerance have been skyrocketing. So what could be causing that? Well, we don’t exactly know, but it’s entirely possible, I think that one of the contributing factors could be weed killer, glyphosate that could be impacting the digestive tract of human beings and killing the good bacteria in our guts. So if you want to avoid glyphosate and you want to avoid eating BT with every bite, then the top thing you can do is to go organic. Because foods that are certified organic are by definition non GMO. You can also go with things that are Non GMO certified. Non GMO certified foods, have grown from nothing to over $27, billion dollars in sales in the US alone in the last seven years, so a lot of people care about this. And then the next level is you can look at what the primary crops are that are genetically engineered and choose to only eat foods containing those crops if they’re growing organically or are certified Non GMO. And those crops most predominantly, there are a few others, but essentially it’s corn. It’s soy, it’s cotton which is being made into cottonseed oil and so called vegetable oils. It’s canola turned into canola oil. And then it’s Alfalfa which is used in livestock feed. And sugar beets, about half the sugar supply in the US comes from genetically engineered sugar beets. So, uh, if you just focus on those crops, you can eliminate most of your exposure. But again, going organically grown is a big deal here. And I will add that glyphosate is now being used as a desiccant even on crops that were genetically engineered to dry the crop out before harvest. This is particularly common with wheat. If this is something that concerns you, if you want to be glyphosate free, then it becomes all the more important to go organic, particularly with your wheat, your barley, and your oats. Now I know a lot of your fans probably don’t eat gluten anyway, but for anybody listening who does, organic really matters in this case. Robyn: Yeah, that’s a great coverage of a complex subject and you can’t really talk about GMOs without covering the roundup or glyphosate issue. So I appreciate all that. And I, you know, just a side note, we’ve covered a lot of these topics with somebody out there who is a researcher and has deep knowledge about these different issues, but I really fear that the reactivity to good foods that people are starting to have possibly because of so much glyphosate, including a second spraying of glyphosate on wheat, is causing more confusion out there, which we already have too much of, over what foods are really good for us, because there’s a lot of nutritious foods that people are reacting to, but they’re not realizing that it’s not that Kale is bad for them or tomatoes are bad for them or eggplant is bad for them or whatever it is. It is a different issue that’s causing the reactivity. So just wanted to make note of that because this is a subject we’ve covered before, but it’s a fairly complex one. These are the kinds of things that Ocean dives into in the book. And one of the things that I like and that really resonates for me Ocean since my very first book whenever it came out 12 years ago, really was about, okay, here’s how we eat whole foods on a budget because I raised four children on a whole foods plant based diet on $45,000 a year of net income. I was a homemaker. And for many years that was the case and there’s very few people who were teaching how to do this economically. So I love that, and I’m not surprised at all because you are such a compassionate individual, I know you’re concerned about the poor. We have so many poor in the country who are at the most risk for diabetes. The most risk for obesity, they’re very disadvantaged to being able to access healthy foods. I know that you talk in the book about eating healthy on a budget. Will you talk a little bit about that? People are always saying to me, you know, organic food is super expensive. What can people do who are on a strict budget? Ocean Robbins: Awesome question. Okay, so I want to talk on the personal level and I want to talk on the systemic and societal level. So I’ll talk personal first within the context that we live in. Okay, so the most expensive calories you ever consume, are excess calories, calories that you don’t need to eat in the first place. The processed food industry is amazing at getting us to eat more than is good for us because we are nutritionally starving and because we’re hooked and addicted to junk foods. So the average American eats about 600 calories too much per day. So those are the most expensive calories at all because they’re bringing sickness and disease and you don’t need them to be healthy. They’re actually hurting you. Okay? The second most expensive calories you ever consume, are food that you waste, actually you don’t need it at all. The average American family wastes about $2,000 a year in food that they literally throw away. So in my book, I have a whole section on how you can plan your menu and your life effectively so that you eliminate, take a big bite out of our totally eliminate food waste. And then the third most expensive calories are foods that end up fueling Cancer. Heart disease, Type two diabetes, feeling like crap. You know, last time I checked, all of these diseases were pretty darn expensive. And so when you cut out the foods that are fueling sickness, you’re actually saving money in the long run. And then lastly, you can also save money when you don’t eat out at restaurants excessively because we pay a real premium price. Even fast food restaurants mark up the actual food they’re serving substantially. Most of what you’re spending isn’t for the actual food. If you can develop healthy habits where you cook in quantity, say on the weekend or when you have some time, when you plan ahead and I walk you through this in my book to help you really implement this, you can actually save time and you can set yourself up for success and then you’re not at the mercy of a restaurants and whatever ingredients they do or don’t use. You’re not at the mercy of having to spend an arm and a leg to eat healthy food. Whole foods shouldn’t take your whole paycheck. And then if you, once you cut out all those wasteful things, let’s talk about what you can eat that’s actually good for your bank account and for your health. One thing is cabbage. Another thing is carrots. I love onions. There are some veggies that are not that expensive and are amazingly nutritious. You can also base your diet around more legumes. Quinoa is a wonderful food, even oatmeal. And then you can add some, you can add berries, you don’t have to go with fresh ones that are $7 for a six ounce basket, you can get frozen berries if you want to and pop those in there, frozen works pretty darn well. Of course, fresh is best, but it’s not always available. There are a lot of wonderful tricks. I talk about them in my book for how you can really save some money and also base your diet around loving foods that will love you back. It’s not that hard and it’s actually possible to have delicious, fabulous, healthy food that’s truly deeply nourishing. Now let’s talk about the systemic for a minute because this is important too. Did you know that in the United States we as taxpayers subsidize junk food with taxpayer dollars? Did you know that we have a farm bill and it essentially provides tens of billions of dollars every year in subsidies for what we call commodities crops. The net effect of this is that we are subsidizing things like high fructose corn syrup and factory farmed animal products. Twinkies have 14 subsidized ingredients. Subsidies aren’t going to fruits and vegetables or nuts and seeds or the things we know we should be eating more of. So if you want to do the right thing for your health, it’s kinda like you’re being fined for wearing your seat belt. You have to pay extra in the marketplace just to take care of your health. So politically we can make changes, big changes, you know, whether you’re a free market capitalist or you’re a social government intervention, loving, you know socialist. I think we could all agree that taxpayers subsidizing junk food is really bad policy. And so I’m passionate about looking at how we can make our food choices and our life choices in ways that help shift the systems in a positive way so that our convenience foods and are fast foods can actually include healthy options that are actually affordable. One of the bright lights I think is a program called Wholesome Wave, which is taking food stamps or supplemental nutrition assistance program stamps and doubling the value for fruits and vegetables. This is a really hopeful direction and what we’re finding is that for the 500,000 Americans that are able to participate in this program right now, they’re eating more fruits and vegetables and we know that’s good for their health, and good for the health of their whole communities. At the end of the day, we all have a stake in the future of the next generation. We all have a stake in the health and well-being of the poorest people in our society because if we don’t support health and wellness in at risk communities, then at the end of the day they are going to be in our hospitals and they are going to drive up the cost of our medical care for everybody. So whether you’re just thinking about yourself or you’re thinking about how we can build a healthier and more loving society for all, we all have a stake in a healthier direction, especially for the people who are the poorest and who are the most vulnerable. So I am passionate about this. And again, in my book I have a whole section on how we need to put our own oxygen mask on first before helping others. But then we need to save the freaking plane. And I have a whole section where we look at how you can make your food choices into a vote for your health and also for a healthier society. Robyn: Well, thank you for holding our feet to the fire on that. There are very few people I’ve ever known who were more committed to considering our actions today for their impact on the future generations. And you and I care about this because we are parents, well and also just global citizens. So here’s the thing. There are a lot of diet books out there and books about food and books about nutrition. And I think it’s pretty cool that your book does not have the word diet in it. Can’t say that I didn’t fall for my publisher insisting that my book had the word Diet in it, my first book. Your book is “31-Day Food Revolution”. What’s unique or different about this book? What is the message you wanted to get out there that is the differentiator between all the other health and Diet books out there? Ocean Robbins: Well, you know, there are a lot of health and diet books out there and some of them are wonderful and some of them maybe are a little less wonderful. But what I wanted to do was really, there are two things that make this book totally unique. One is that there are 31 chapters and every single chapter ends with action steps you can take. I didn’t want this to just inform people. I wanted it to empower people. So that as you’re reading it, you’re constantly learning how you can apply what you’re learning and put it into action because at the end of the day that’s what counts. And the other is that I look at food as being personal and social and political. It’s all of it. And so my book actually has four parts. I take people through the journey and part one is Detoxify, and that’s where we look at how we can get rid of the bad stuff that’s making us sick and clean up our kitchens and our homes and our bodies and our lives. Part two is Nourish, and that’s where we focus on how you can say yes to the healthy superfoods, the real super foods that will help you thrive, that have been proven in thousands of studies to be beneficial for human health. And then in part three, we look at how we can gather our tribe, our community, our relationships, so you can have the sense of belonging, the sense of community in your healthy food journey. A lot of people I know feel alienated, lonely, isolated, and pressured to go with the status quo. We’re in some ways herd animals, not lone wolves. And so in Gather, we look at how you can leverage that so you can create a social network that empowers you so you can interact with effectively and lovingly and respectfully with people who eat very differently from you and how you can lift people up and be a positive influence on the people in your life. And then part four, Transform, is where we look at the social and political dimensions of food and how we can leverage our food choices to build a healthier world for our kids, for everybody on the planet. How we can use our food choices to build a healthier climate for future generations. How we can preserve our water supply and our precious aquifers and our top soil for future generations. The reality is that what you eat literally shapes the future of life on earth. Robyn: Yeah. It’s so funny. I think about all the missteps I made early on when I changed my diet and stopped eating meat every day in my life and probably went 98 to 99 percent Vegan, which is what I’ve been for 25 years. I just wanted to tell everybody about it. I wanted to run people down and say, Hey, this could help you. And it just did not go very well for me. And my daughter who became a vegetarian at the age of 11 after I bribed her to read Eric Schlossinger’s book “Chew On This”. I think at one point in high school she described the scene where she’s literally standing on a table holding court about veganism and I said something to her about, well, how’s that going for you? And she admitted that no one had been interested in eating more plant based as a result of her actions. And so I think the whole movement towards, you know, as Gabriel cousins said, I interviewed him earlier today, saving an entire swimming pool per year per person who eats a plant based diet or you know, cutting your risk of diseases by 75 and 90 percent just by eating plants instead of animals and processed foods. It starts to resonate more when we make sure we lead with love. And you have helped model that. And I’m excited for millions of people to read your book, like people have your father’s book. You’re just carrying the torch. And so tell us because you know, you’re great about not getting super dark and depressing about these global issues that face us all. What are you hopeful about? What are you bringing forth in this book that makes you really hopeful about the future for our kids and our grandkids? Ocean Robbins: You know, Robyn, there are so many places in life where we can feel overwhelmed and cynical. So many problems in our world that can feel almost unconfrontable and certainly irresolvable. But when it comes to food choices, we have incredible power. You know, they say to think globally and act locally. Well, you can’t get any more local or more global than the food on your plate. And this is one place where we don’t have to say you can make a difference. We can actually say you do make a difference. Every bite you take, every dollar you spend on food is kind of vote. And you’re saying yes to more of the same. So when we choose to make that vote, a conscious one and an intentional one, we take our place, uh, not as passive recipients of the world, but as active participants in the world, we become leaders. And that to me is what the food revolution is all about. That every single one of us has fundamentally a choice. We can be complicit in the status quo or we can be everyday revolutionaries. And when you choose to become an everyday revolutionary, you have more bounce in your step. You have more vibrancy in your heart, you have more joy in your life, you have more health, you have better circulation in your veins, you have a better blood flow to your brain and your sexual organs. Everything works better because you are saying yes to the foods that truly empower your life and your wellness. And to me this is so beautiful, however much you’re hurting, however much you’re struggling, either with your fear about the world or with your fear in your own health and life, that’s how much better things can be with a change. So I say yes to life, yes to love, yes to vitality and food is the most powerful stand we can take. You know, they say food is the foundation of health or the foundation of disease. Well, it’s true. It’s the food. And when we bring our food choices into integrity with our values, with our dreams, with what we really want for our lives, the entire world gets brighter. Doesn’t just feel brighter, it actually gets brighter. There’s more topsoil for future generations to grow food. There are more rain forests left standing. More indigenous people have their homeland protected instead of cut down for cattle grazing. There is more water for future generations to grow food because it’s not being pumped out of our aquifers to turn it into cheap beef. We literally get to stand for a world where our kids are able to grow food healthfully and beautifully. That’s the opportunity and the invitation before us right now. I think it’s a beautiful one. I say yes to it. I invite everybody listening right now to say yes to it, to become part of this food revolution. Claim your power, make a difference, and the spoiler alert is, it is a heck of a lot easier to change the world than you ever imagined. Robyn: So inspiring. I know that for every new copy of your book that is sold as you’re launching here, you’re going to donate to “Trees for the Future”, which sounds really cool. I want you to connect me to them because I give money every year, quite a bit of money to several organizations. I fund polygamous kids getting out of their communities here in Utah to go to college and a lot of women and children empowerment, getting them out of poverty initiatives. But this is really interesting. You’re giving, you’re donating for every book so that an organic fruit or nut tree is planted in low income communities. That’s what “Trees for the Future” does, which is really, really cool. So don’t borrow the book. Don’t check the book out. Purchase the book because you’re actually doing some humanitarian service here with each purchase. Tell everyone where they can get your brand new book. Ocean Robbins: Okay. Yeah, so I love “Trees for the Future” and I love being able to plant an organic fruit or nut tree in a low income community mostly in sub Saharan Africa for every single new book purchased. And uh, you can get the book at your favorite bookstore. You can get it online or you can go to 31dayfoodrevolution.com. Again, that’s the number three one day food revolution.com. And get it from our website. This is an amazing resource. I wrote it for you and for everyone you love. And in fact, if you want to give somebody the gift of health, go ahead and get multiple copies. And here’s a tip. You can do this with Robyn’s books too. By the way. Go ahead and stick a post it note on the front when you give it to somebody that tells them like on page 73, I thought of you, or page 16, I really had to chuckle. You won’t believe how much more likely they are to actually open the book and read at least page 73 or page 16 or whatever it is you’re referring them to. You can do the same with a DVD. If you give somebody a DVD, make sure to tell them like a specific timing cue, you know, at three minutes, 17 seconds, there’s a part that made me think of you. Your likelihood that they will consume at least some and likely all of that content just quadrupled when you do that. Robyn: What a great tip. I’ve never thought of that. Sometimes I write in the front cover, but gosh, they might not even open the front cover. They set it next to their bed and two years later they still haven’t read it. That is such a good idea. Okay, so great gift idea. Should they buy it on Amazon? Anywhere books are sold? Any place you prefer that people pick up your book? Ocean Robbins: Um, the best place to buy it is the place where you’ll actually get it and put it to work in your life because the most important thing is that you read it and use it. Robyn: Perfect. Well, thank you so much for the amazing work that you’re doing in the world Ocean and best of luck on your book launch and thanks for being with us today. Ocean Robbins: My privilege, Robyn. Thank you so much. Love this podcast ! I just ordered the book and cannot wait to dive into it. Thank you for sharing this plethora of information !